Vicente Calderón Stadium, Madrid, Spain. Atletico Madrid prevailed in a nail-biting penalty shootout to progress to the Champions League quarter-finals after a physical affair in Madrid. Kiessling would ultimately blast his spot kick way over the bar to spark celebrations in the Spanish capital, but last season's runners up were forced to work hard. Fans turned out in full to the Spanish capital, fabricating a phenomenal atmosphere just like the cauldron Diego Simeone requested in his pre-match interview. Even their Croatian assassin Mario Mandžukić was cheer-leading the crowd to get vocal when a corner-kick was won. Early indications showed that referee Nicola Rizzoli had his hands full, as Atletico piled on the pressure and at an expense of that conceded a few fouls in the opening stages. The Germans were in a spot of bother to start the game with the rallied Madridiens chasing down everything, replicating what Bayer did to them in the first leg as they played very high up field. Risks of that style were shown early though, as Bellarabi saw his shot trickle wide out for a corner, marking the first attempt of the visitors in a very energetic opening 10 minutes. They would continue to give themselves a miniature shout in terms of the contest, but Atletico were showing much more desire when accelerating forward. Things would take a sour turn though when Atletico were dealt a major injury setback to their goalkeeper Miguel Ángel Moyà as he suffered a hamstring injury. As Son paced into the box with the ball, the 30-year-old shotstopper would get to the ball before grimacing as he held his hamstring and Jan Oblak would replace him. Some 27 minutes in, Atletico would bear the fruits of their labour as their pressing game finally conjured up a crucial goal. From Koke's free-kick, Cani helped the ball to Mario Suarez who ran into strike it with venom, taking a deflection, as it drift past Leno for the opener and to level things on aggregate. Diego Simeone's eccentric celebration highlighted the magnitude of the goal. A frantic, yet compulsive 30 minute period had ended with the most successful of rewards, and provided fuel to the fire for the hosts to push on. Turan found Mandzukic with a pass of perfection, but as he prepared to arrow it in, Wendell stopped him with a fantastic challenge. Soon after, Antoine Griezmann's free-kick struck the wall. Both sides eased into the second following the sheer amount of work they had to do in the second half. Griezmann's run prior to the hour mark caused some concern as he darted down the left wing, but Spahic got rid of the ball in. Bellarabi slashed from long range, a glimpse of Leverkusen going forward, while they had little to produce and hold up against Atletico. Tension was beginning to settle in, though. Extra-time was looming and both sides knew it. So many challenges were coming in left, right and centre. 90 minutes wasn't enough, we were headed for extra-time. We were in for 30 more fiercely-contested minutes of football. Within seconds, players were surrounding the Italian diplomat, referee Nicola Razzoli, to defuse an early escalation. Exhaustion was beginning to settle in, but with neither side willing to succumb, they were poised to fight tooth and nail. Leverkusen upped the ante by making things more physical, but no player was immune to picking up a knock from the furious of the game. Lars Bender was replaced by Papadopolous before half-time of extra-time. No big chances came in the first 15 minutes, all remained up in the air. Atletico were digging deep to start the resumption of play. Leno defiantly stopped Garcia, and Griezmann's run caused a world of troubles for the German contingent. Hearts were in Atletico mouths as Oblak scrambled to his right-hand side while not needing contact on the ball. The skipper Rolfes struck from well out, but it drifted just wide in a spectacular effort that could've been the winner. Griezmann then caused concern for Leverkusen as he blitzed through with a nutmeg, but couldn't break through into the box. Slowly but surely, Atletico were easing themselves ahead in terms of quality of the play. Pressure clearly got to the players but with the Kiessling miss, it was a harsh exit for the Germans but a thrilling triumph for the hosts who march on. 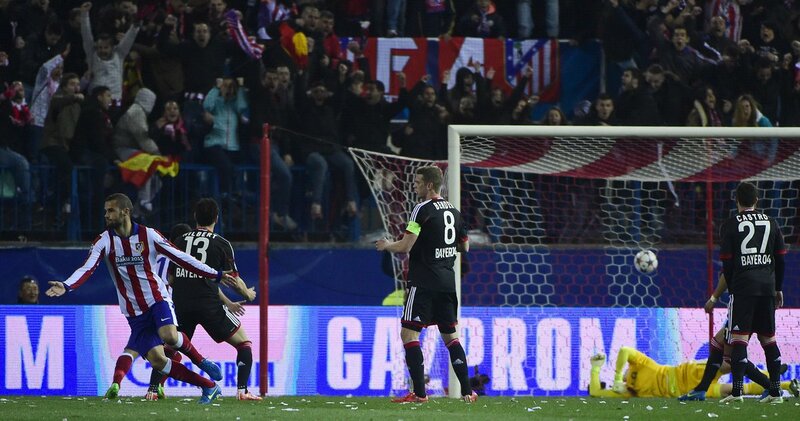 Atletico escape Leverkusen on penalties in UCL Round of 16.